Until Taking Care of Lex is completed. Dairihill is a Bosmer noble serving her time as the personal steward of Countess Millona Umbranox of Anvil. She is currently trying to get her cousin promoted to the position of captain of the guard in Anvil, as the Countess believes that the current Guard Captain Langley doesn't take his job too seriously, although she seems to be upset by the Thieves Guild interfering with the recommendation. 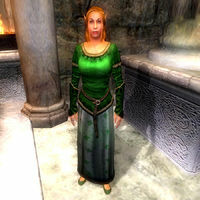 Although her role in the Castle is important, Dairihill apparently prefers to spend most of her time dealing with personal affairs than attending her duties as the Castle steward. From Morndas to Fredas, Dairihill will start the day early at 6am by wandering around her room in the Private Quarters. At 8am she will head to the throne room to accompany Countess Umbranox and assist her with her duties until 2pm, when she will head back to her quarters, believing the Countess has everything under control. Once there, Dairihill will sit behind her desk where she will spend the next six hours reading her copy of the Guide to Anvil. Once the clock strikes 8pm, she leave her private quarters to attend the formal dinner in the company of the rest of the Castle staff until midnight, when she will return to her room for six hours of sleep. On Fredas and Loredas, when the clock strikes 12am and the day changes, she will instead leave Castle Anvil and will travel all the way towards the Barracks, where she will actively look for Captain Langley. Once she has found him she will wander aimlessly around the Barracks (see bugs) until she decides to return to the Castle, where she will spend the rest of the day inside her chambers, skipping her daily audience with the Countess altogether. Once the day changes back to Morndas, she will once again return to her old routine and will instead retire to her own room to sleep and resume her weekly schedule. The only exception to this routine occurs during the very last stages of Ultimate Heist, after the Gray Fox asks you to hand over a ring to the Countess. During that time, Dairihill will stay away from the throne room and instead wander her room in the Private Quarters until the quest is completed. Like most of her fellow stewards, Dairihill wears a full set of upper-class clothing, which consists of a green brocade doublet, a green silk garment and green velvet shoes and also wears a leveled piece of jewelry. She is armed with a fine steel dagger and carries around a useful raft of keys, her copy of Guide to Anvil and a leveled amount of gold. The first time you meet her she will speak about her profession and how they do things "differently" in Anvil than the other Counties, saying: "I'm Dairihill, steward of Castle Anvil. We do things differently in Anvil. And the difference shows in the comfort and trust of its people." When questioned about Anvil, she will state that she actually has the Countess' permission to deal with her own personal matters: "The Countess deserves all the credit. I do things my way, indeed, but she gives me the authority and support." On the matter of the new Guard Captain, she will at first be thrilled if you manage to ask her while you still haven't recovered the letter: "Yes. My cousin is in line to take up the position. He is eminently qualified." However if you show her the letter, she will instead tell you: "You what! But I didn't... I mean, of course. I'll take that letter now. I'll personally make sure that Lady Umbranox gets it." If you refuse to handle it to her, she will be outraged and will threaten you by saying: "You insolent... do you know who I am? I'll see that Countess Umbranox knows what kind of a fetcher you are! ", however if you give her the letter, she will proceed to reward you with 20 gold for handling the letter: "Smart move. I hold the power in this castle. Don't forget it. Here is a small token of my esteem." When you finally deliver the letter to the Countess yourself, you may speak with Dairihill to tip you, to which she will angrily respond: "She wants me to tip you! You add insult to injury. You cost my cousin a chance at that job. Take your money and get out of my sight!". This will also cause a disposition drop of 30 points from her. Dairihill is such a schemer that even your current Doyen, S'Krivva is suspicious of her: "Dairihill cannot be trusted. You must deliver the letter to Lady Umbranox in person." sums up her opinion of her, along with "The letter is currently in steward Dairihill's desk. She has lied to Lady Umbranox, telling her that the letter has yet to arrive." The Countess had been taken in, and will tell you that "Hieronymus Lex looks like the best choice. I was about to give the position to Dairihill's cousin." Dairihill was supposed to sleep with Langley on Loredas and Sundas, however most of the beds at the Barracks are single beds, and thus Dairihill will have no choice but to simply stare at him while he sleeps. Even if she could actually find a double bed where she could sleep, she would still be forced to simply follow Langley around because the reference of the package (DairihillSleepWithLangley) is attached to Langley himself rather than an assigned bed. Also, all the beds are owned by the Anvil guard faction, to which she doesn't belong.